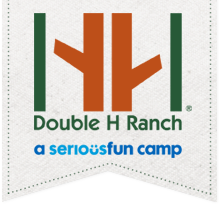 The honor of your presence is requested to join the Double H Ranch for a truly unforgettable day. Will you choose to hit the links for a Pro-Am (four amateurs and a Pro) on a legendary Donald Ross course, OR join us for an extravagant Chef’s Dinner later that evening? Please contact Robin DeMattos, Corporate and Special Events Manager, at (518) 696-5676 x228 or e-mail rdemattos@doublehranch.org with any questions. We are confident that you have heard (and read) this before – what a truly wonderful experience you provide at Double H Ranch! We just wanted to take a moment and express our heartfelt gratitude to each and everyone of you for the great time our daughter Melanie had at camp during Session 2. From the very first second upon entering the camp grounds and being greeted with applause and cheering to the tearful singing and hugs good-bye we knew she was in good hands. In fact although you tell people that Double H stands for Health & Happiness – we know the secret (shh – we won’t tell). Double H really stands for Heavenly Hands! Thank you for making a difference – making a difference in the lives of the campers who attend, like Melanie and also making a difference in the lives of the families too (like ours!). We are telling everyone of Mel’s adventures – whitewater rafting, overnight tent camping, and zip-lining. We have tried to always include Melanie in everything we do – to not let her physical condition prevent her spirit from experiencing all that life has to offer. She is a blessing to us. She has transformed our lives and so often the lives of those she meets. We have been blessed by all of you – from the nurses, to the maintenance worker, to front office staff, to the board of directors, the corporate partners, to the 2nd grader reading books to raise funds, and especially the wonderful counselors in the Bear Cabin.